DhhEAF (Deaf and hard of hearing Educational Athletic Foundation) is the only program in America which teaches life's lessons to Deaf and hard of hearing youth through tennis. Our classes have an immediate positive impact upon our students' social and emotional well-being as well as their physical and mental health. Rather than trophies, we would prefer that our results produce happy, well adjusted & good people. We provide this underserved population an opportunity to learn and practice a life-long physical activity in a pro-social environment. The development of the DhhEAF Program aims to expose young, DHH people to the ideas of teamwork and self-discipline that can lead to success in other aspects of their lives. Our Program is free and we reach about 200 students/year. World-citizen Helen Keller profoundly noted, “My blindness separates me from things, but my deafness separates me from people.” Because ASL syntax does not follow the same rules as English grammar, DHH students encounter various communication challenges. And since DHH students are usually bussed to a centralized school, there are no friends in their own neighborhood who can communicate via ASL. It’s no wonder that a their world can be extremely lonely and isolated. No buzzers, bells, whistles, or play-calling makes tennis a perfect game for the DHH and it is also a vehicle where they can connect with others, forever. However, because of communication challenges and a lack of skilled instructors, they will never be a demographic group which will be targeted by the tennis industry. Additionally, current affordability is not feasible because most of our students are from inner city, low income families. Therefore, the DhhEAF Program is the only way many of our students will ever be exposed to tennis AND receive professional instruction. In our DhhEAF classes, hearing aids and cochlear implants are the norm rather than the uncomfortable exception. And tennis is an equalizer. 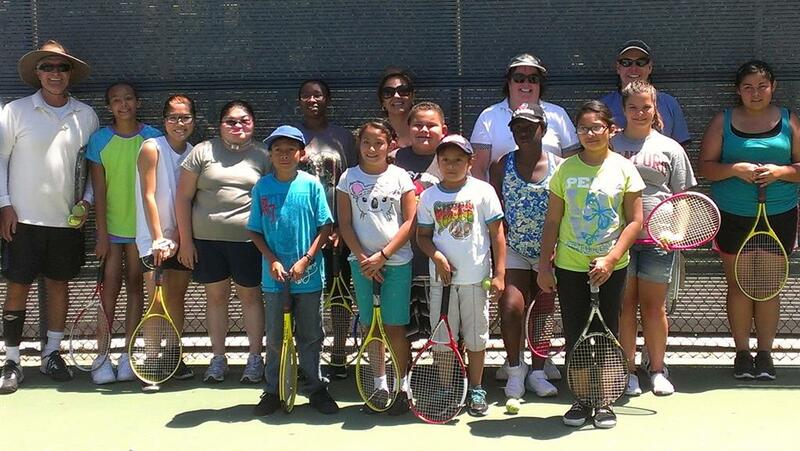 The Deaf students take note that everyone has similar skill-set challenges in learning to play tennis. With guidance, they realize the satisfaction of learning and gain self-confidence with improvement. Students appreciate that tennis can be a lifetime socialization activity, a fitness/health maintenance vehicle and an instrument to preserve and better understand Deaf Culture. We seek to affect academic improvements, good citizenship qualities, and self-esteem enhancement. Benefits can be extrapolated into better mental & physical health, & enhanced employment skills. Because language doesn’t matter, the universal rules of tennis can foster friendship and inclusion for the DHH anywhere they live for the rest of their lives. Lessons have been provided to DHH children at more than 25 schools in Southern California. We have directly reached over 2,000 DHH students since our inception in 2003. In our DhhEAF classes, hearing aids and cochlear implants are the norm rather than the uncomfortable exception. Tennis uniquely presents teaching & learning opportunities. The students take note that everyone has similar skill-set challenges in learning to play tennis. With guidance, good effort, and practice, they realize the satisfaction of learning and gain self-confidence with improvement. Years ahead of evidential results from recent Studies, we’ve promoted DhhEAF to our students, teachers, parents & Administrators whereby our Program can create better students: Enhances concentration, necessitates critical thinking & problem solving, and builds character. Advanced players and quick learners with a comprehensive understanding are utilized as mentors for students where these skills are more difficult to master. As mentors, they interact with different sub-groups and gain their own level of self-confidence and gratification. The program is then customized so that each student progresses within his/her own level of success. Students understand they can play at a competitive level or just to have fun and socialize. We can exact an immediate impact on their quality of life. Short term, we impact mental, emotional, and physical health by promoting thinking, learning and activity. We also give them hope & a personal belief foundation. We instill a work-ethic that can give them inspiration & self-confidence when challenged with reading or math studies. Long term inclusion can bring about a brighter future as well. Because the rules of tennis are universal, the game can foster friendship for our young charges anywhere they live for the rest of their lives. To that end, the benefits of life-long play (obesity, diabetes, etc. ), and a friendship network will take longer to evaluate. We have enough positive experience to validate the expansion to reach additional DHH students. Our hope is that someday tennis will be available for every DHH student in the country. Extracurricular programs help children in many ways but it's difficult to find ANY Programs specifically for the DHH. With that need in mind, the DhhEAF Program was created by Roy Trafalski, a positive role-model with a blend of elite-coaching and playing experience, business acumen, and professionalism. His credentials both on, and off the court are stellar. Roy was a high school football player in Buffalo, NY when a friend introduced him to tennis and he took a liking to the sport. His parents could not afford lessons or premium costs for indoor court time. However, he read books / magazines, observed skilled players, practiced hitting on the wall, and honed his game. In the process, he learned important lessons: The benefits of hard work, problem solving, perseverance and fair play. Roy is a Certified Tennis Pro with the USPTA and the only Pro in America dedicated to the DHH. He's a former university coach, nationally ranked senior tournament player, and Coach of the 2005 USA Deaflympic Tennis Team where competition was held in Melbourne, Australia. There are few individuals who possess his unique tennis AND communication skills to introduce and nurture the growth and advancement of this special needs population. He's confident that his enthusiasm for teaching, far reaching knowledge and passion for the game will translate into a myriad of success for his DHH students. He's committed to DhhEAF as a long-term project and believe it has the potential for national implementation.